At WP Rawl, we love our greens! But we know that sometimes it can be difficult to get someone to add greens into their everyday diet despite the abundant nutritional value that greens provide. When introducing greens to your children, you want to avoid fooling them or tricking them into eating greens. It’s likely to cause mistrust. Instead, offer up dishes that incorporate greens in a way that you won’t notice a difference in taste or texture just because a green has been added. You can do this by pairing a green with a trusted favorite—you’ll be more likely to get even the pickiest eaters at the table to try a bite (or two!) without much protest. You can also invite your children into the kitchen to help you prepare a snack or cook a meal that includes greens on the ingredient list. Not only will you be creating memories and teaching necessary life skills, but it’s an easy way to introduce new ingredients to your children. Let them feel, taste, and cook with different ingredients as a way to become more familiar with them. The more familiar they are, the more likely they are to try them and enjoy them! Our Sweet Green Smoothie combines 1 1/2 cups of collard greens with lime juice, mango juice, orange juice, and grapes to create a sweet, flavorful smoothie. You’ll notice the collard greens in the smoothie by the bright green color, but it blends in exceptionally well with the fruit juices and grapes. Put a new twist on Taco Tuesday at your house with our Beans & Greens Quesadilla. In addition to all of your favorite Mexican flavors, this quesadilla also includes a heaping handful of kale. The kale is mixed in with the black beans, corn, bell pepper, and spices, and you’ll barely notice it when you bite into the quesadilla! Are your kids craving pizza this week? 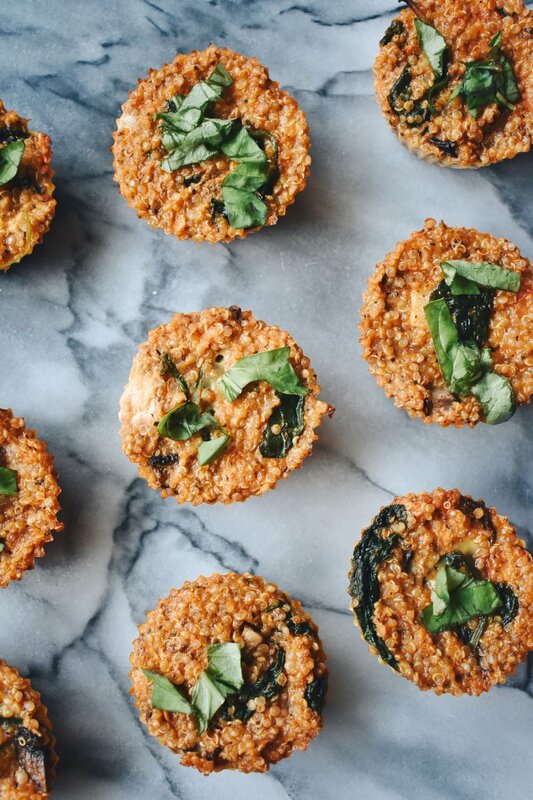 Try out our Quinoa Kale Pizza Bites dipped in marinara sauce. It’s an easy meal to cook with your children—let them mix all of the ingredients together in the mixing bowl and spoon the mixture into the muffin tin. You’ll definitely see pops of green in the pizza bites, but your kids will be too busy devouring them to realize they’re eating kale. How do you add greens to your everyday recipes so you and your family can enjoy them without noticing that they are there? We’d love to know! Share your recipes with us on Social Media by tagging @naturesgreens and #BacktoFresh. We can’t wait to see what you all are preparing in your kitchens!